Every browser has dozens of keyboard shortcuts The 9 Most Powerful Chromebook Shortcuts for You to Learn The 9 Most Powerful Chromebook Shortcuts for You to Learn For those of you who are just starting to love your Chromebook, it's time to learn how to get super-productive with your Google OS device. Read More , but some shortcuts are more valuable than others. In fact, some are so revolutionary that you’ll wonder how you ever browsed the Web without them — similar to that feeling when tabbed browsing became a thing. 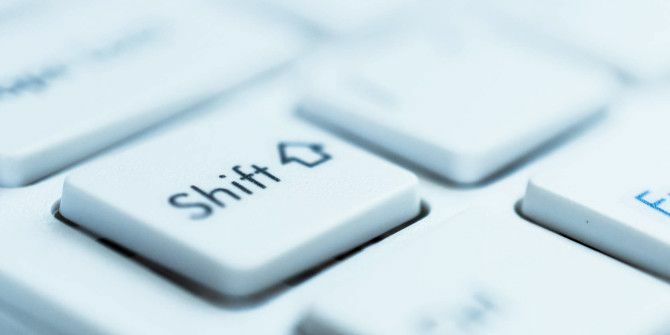 The Shift key plays a big role and it’s about to change your life. Using the scrollwheel on your mouse — you do have one, don’t you? — is the easiest and most convenient way to browse the Web, but what do you do when you come across a page, textbox, or iframe that scrolls horizontally? If your usual reaction is to roll your eyes and drag the scrollbar manually, try using Shift + Scrollwheel instead! It’s much quicker and easier. If you’re like me, you probably have dozens of tabs open in your browser at any given time. Maybe you’re saving them to read later 9 Tools to Save What You Read on the Web for Later 9 Tools to Save What You Read on the Web for Later Have you ever gone back searching the Internet for something you read and just couldn’t find it? I think we all have – it’s quite frustrating. The problem comes when we don’t take the time... Read More or you’re just really good at multitasking Single- vs. Multitasking: What's Best for Productivity? Single- vs. Multitasking: What's Best for Productivity? Multitasking is a common method to increase productivity. Turns out it's not necessarily the silver bullet for productivity. The key is to know when to multitask. Read More . The problem is when you accidentally close a tab before you mean to. Most browsers support the Shift + Ctrl + T shortcut which reopens closed tabs one by one in reverse order. Hold down Shift + Ctrl and keep tapping the T key to keep opening tabs. Did you know that the Spacebar key pages down on the page you’re currently viewing? A lot of people do this accidentally without realizing it. Even fewer realize that Shift + Spacebar pages up. The next time you’re reading a long article or essay Don’t Squint or Strain: Improve Readability in Firefox With These 8 Add-Ons Don’t Squint or Strain: Improve Readability in Firefox With These 8 Add-Ons Whether you spend many hours on your computer, use your display often at night, or just want to improve your reading experience, there are Firefox extensions to help. Read More , try using the Spacebar to read. It’s more convenient than you think. Got any Shift tricks to share? Tell us in the comments! Explore more about: Keyboard Shortcuts, Tab Management. The Google Chrome Keyboard Shortcuts Cheat SheetOpera Has Good Features, so What’s the Problem? Hello there! I have an interesting problem, when pushing the scroll wheel down on the mouse, a function that enables you to scroll up/down/right/left when moving the mouse should be enabled, but it doesn't work on my Chromebook Acer 720. Why? It works on every computer but not on my chromebook. Is that a specific function for Windows? I hate the spacebar scroll so much. I just don't understand the point. Keyboards have had page up and down for a very long time. Even on small format keyboards there are usually keys that are at best dedicated keys and at worst Fn + something. Also, if you don't have the video on a page selected (such as on youtube) you unintentionally scroll instead of starting or stopping the video. Nice! So it's basically a browser bomb. Not sure when I'd use it, but I'm sure it will end up being useful at some point or another. Thanks for sharing Pedro! The zooming shortcuts are useful to know, especially when you accidentally shrink the website and aren't sure how you did it. Lol. Thanks for sharing Neil! This is the most useful shortcut. I always used to right click>open link in new tab and then had to return to the previous tab. That's one of the best ones. Thanks for sharing Mark! Most browsers and websites also recognize the PgUp and PgDn keys. No extra keys needed. I use a wireless keyboard and Pg Up & Pd Dn keys are shared with Up arrow key & Down arrow key, meaning I need to press the Fn button + Up/Dn.. SO there are use cases for the Spacebar, at least in my case..
Hey Michael. You're right, PgUp and PgDn are pretty much universal. My problem with them is that they sit on the opposite side of the keyboard while my hand usually rests on the WASD side of the keyboard. My right hand is usually occupied by the mouse. So, it's far easier to use Spacebar and Shift+Spacebar than it is to seek out the PgUp and PgDn keys. Backspace goes back a page. Excellent, that's a good one! Thanks for sharing Tom. Shift+Ctrl+Del – Open the Clear Browsing History window. Shift+Ctrl+H - Open the Browser History. Shift+Ctrl+B - Open Bookmarks Manager. Shift not needed for the last two on Firefox. Yes you are right - too a point, try the shortcuts without Shift and you should see the difference yourself. not in chrome. shift ctrl f5 does nothing and shift ctrl b opens and closes the bookmarks bar.